New Year resolutions? I’ve often made them only to drop them before I even get to the end of January. Perhaps I didn’t make them specific or realistic enough, or perhaps I didn’t really make a heart commitment to them. Usually my resolutions related to outward changes such as writing goals or weight loss, but this year I want to make a heart commitment to a spiritual goal. 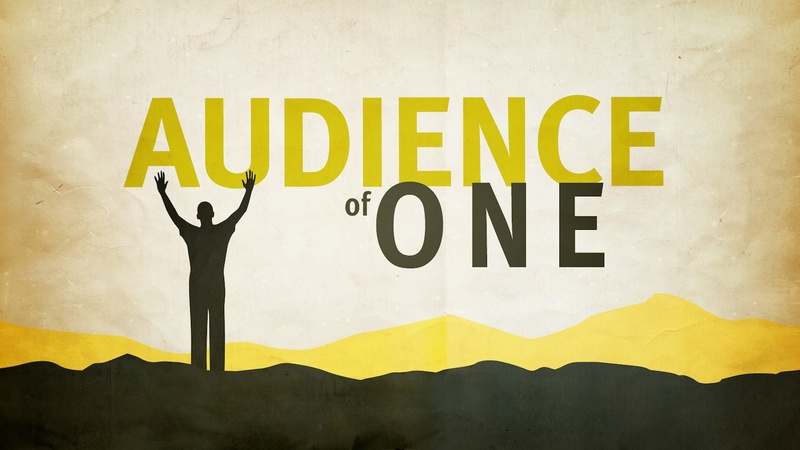 My resolution for 2012 is to live as if I am in the audience of ONE. Too often I seek the approval of a people audience. I hate confrontation, and I want everyone around me to be happy. As a result, I ignore my gut instincts and compromise my beliefs. I don’t speak out or take action when I should, because I’m afraid I may hurt someone’s feelings. Other times I say something just to make a person feel better or because I know that’s what he/she wants to hear. When confronted by criticism, whether face to face or behind my back, I too easily overanalyze the situation and internalize it – there is something wrong with me. I overreact and crawl into the dark, smelly hole of insecurity – I never do anything right and I will never measure up. Then if I let myself stay in this hole, I tend to take even loving advice or constructive criticism as a personal attack. In The Art and Craft of Writing Christian Fiction, Jeff Gerke shares how his “lifelong addiction to the approval and validation of others was nothing but false thinking.” Jesus freed him to “begin writing – and living – simply for Him.” He was brought to believe we have more than enough approval through God. We even have His favor and delight. Like a stuck record, my needle to seek approval from people, including the harsh critic of self, will tend to stick again and again in that same annoying scratch. I will need to actively pull it out of its rut and point it in the right direction – towards God Who gives me all the approval I need. I will need to daily pursue His promises – to capture them to my heart, to plead upon the faithfulness of the Promise Keeper, and to cling to them as to a life-preserver. I encourage you to live as in the audience of ONE. Jesus is the Ultimate Cheerleader, the only one we will ever need. In Him and through Him we can be freed from the slavery of approval addiction. Because He has already paid the price, He will never be hostile or judgmental. He may need to set us straight from time to time, but it will always be as a tender Shepherd Who loves His sheep and guides them away from danger. So let’s entrust our safety to Him and seek His guidance in 2012. What spiritual resolution have you made for this year? What do you do to keep your heart committed to it? You are welcome. 🙂 Peace and joy to you as well!